I Can't Hake It Anymore! 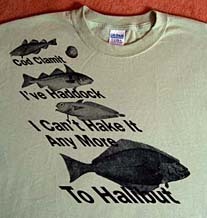 To Halibut! Who but an Atlantic fisheries fisherman from Maine – facing depleted stocks and ever increasing regulations – could concoct such a saying!? This gentle cuss can politely get out all your frustrations and tell it like it is. Suitable for good company, these t-shirts are sure to get a good laugh! My father and brother were both fishermen. They couldn't have said it better! Our tees are printed in Maine on 100% heavyweight preshrunk cottons. Available in White, Heather Grey, Smoke Blue, and Ocean and in sizes S - XXXL. Select your size and color from the table on the right to purchase! Price is $16.95 plus $4.95 shipping and handling. Please add $2.00 for tees plus $1.00 shipping and handling for sizes xxl and xxxl. Maine residents add 5% sales tax.